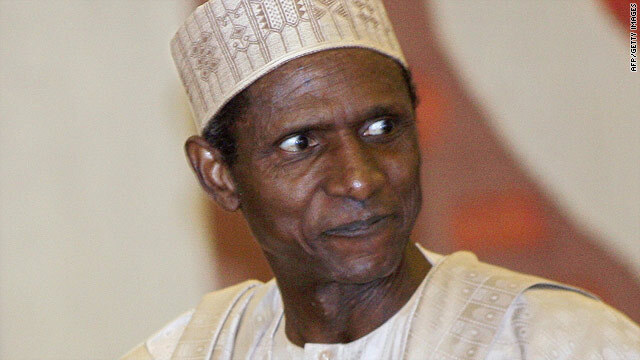 Umaru Yar'Adua was the president of Nigeria, the most populous nation in Africa. He was 58. Lagos, Nigeria (CNN) -- Nigeria's ailing President Umaru Yar'Adua, who gave amnesty to armed militants in the troubled oil-rich Niger Delta region, died Wednesday, the country's information minister said. He was 58. Yar'Adua had not been seen in public since November, when he went to Saudi Arabia for treatment of an inflammation of tissue around his heart. He was diagnosed with that condition, acute pericarditis, last fall after he complained of chest pain. He returned to Nigeria in February but had remained out of sight. Vice President Goodluck Jonathan has served as the country's acting leader since Yar'Adua fell ill. The president, a soft-spoken and unassuming figure who did not bask in the media spotlight like past leaders of the West African nation, pledged to fight to improve the country of 150 million people despite the accusations. President Barack Obama issued a statement late Wednesday expressing his condolences to Yar'Adua's family and the Nigerian people. "President Yar'Adua worked to promote peace and stability in Africa through his support of Nigerian peacekeeping efforts as well as his strong criticism of undemocratic actions in the region," Obama said in the statement. "He was committed to creating lasting peace and prosperity within Nigeria's own borders, and continuing that work will be an important part of honoring his legacy." His election followed wide support from his predecessor, leading critics to label him a puppet of the former president, Olusegun Obasanjo. After he was elected, Yar'Adua replaced some of Obasanjo's top officials, including the head of the army, a move analysts said was aimed at shedding off his predecessor's influence. Analysts say he did little to institutionalize reform in a country where two-thirds of the population lives on less than a dollar a day. "Because many people feel disillusioned economically and as long as they have those sentiments -- I think the risk of radical uprisings in places like northern Nigeria and certainly southern Nigeria in the Delta will continue regardless of who is in power," said Rolake Akinola, an analyst at Control Risks West Africa. Yar'Adua, a former chemistry teacher, was married twice and has nine children.